About 10,000 armoured vehicles 1941-2016. The Creation of the modern Indian Army was related to the independence in 1947 but it not fallen out of the blue. Warfare in India was indeed thousands of years old. Since the Mauryan dynasty that built the first Indian empire (300-200 bc) tactics and formations were known and refined as an art since centuries, forged by constant warfare between kingdoms of the subcontinent. Since the occupation of India by the British East India Company in the XVIIIth century, local auxiliaries were seen in the Empire’s armies all around the globe, a tradition passed onto the the British Indian Army, right in ww1 and ww2 from North Africa to Italy against the Germans & Italians and against the Japanese on the Indian border, Singapore, Malaysia and Burma. The ACV Indian Pattern, first mass-produced armoured vehicle built in India and for Indian troops (1940). Since the 1930s, there were already several types of armoured cars and light tanks modified for colonial service, known as the “Indian pattern” and often tropicalized. WW2 saw the only model of armoured vehicle built in India, the Armoured Carrier, Wheeled, India Pattern Mark II/IIA/IIB/IIC built from 1940 to 1944 after a Ford Motor Company of Canada chassis and assembled and completed by the East Indian Railway and Tata Iron & Steel Company. These rear-engined vehicles saw service chiefly against the Japanese. Shortly before the partition of India between India and Pakistan (East & West), four of the ten Gurkha regiments were transferred to the British Army, but the rest of the former army was divided between the two new nations. The Punjab Boundary Force which had a mixed composition was disbanded. The first test came immediately over a border dispute in Kashmir and was followed by the Invasion of Hyderabad in 1948, the Portuguese-Indian War of 1961, the Sino-Indian war of 1962, the Indo-Pakistani War of 1965, the Indo-Chinese conflict of 1967, the Naxalites uprising of 1971, the Indo-Pakistani War of 1971 (liberation of Bangladesh), the Siachen conflict in 1984, the Kargil war in 1999, Operation Blue Star and Operation Woodrose against Sikh extremism, counter-insurgency in Jammu and Kashmir and operations of peace keeping in Sri Lanka and elsewhere. Such long history of conflicts saw a fertile ground for building and cultivate tank warfare and tank design. 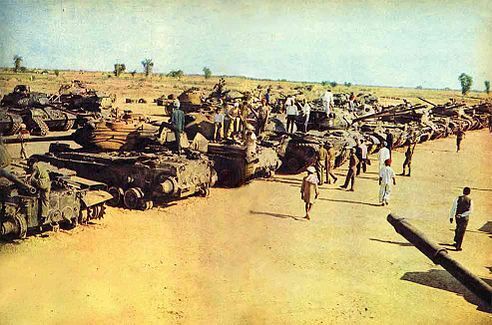 Indian Tankers had the occasion to show their skills at the Battle of Asal Uttar (8-10 September 1965), where they destroyed more than 100 tanks, mostly M47 Pattons, here gathered at Bhikhiwind, India, and “Patton Nagar”. Due to a shared past with the British Army, the organization and discipline of the Indian Army are closely modeled on this early model and still remains similar today. The Recruitment is based on voluntary service with a military conscription written in the Indian constitution but never imposed. In 2010 the army which is overwhelmingly professional had a strength of 1,129,900 active and 960,000 reserve personnel. Of the latter, 160,000 were in the Indian Territorial Army, but only 40,000 regularly report for duty. So by any means, this makes the Indian Army the world’s largest standing volunteer army. 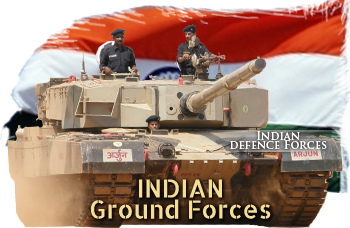 According to the Indian organization of the Indian infantry, regiments are to provide battalions and well-trained personnel to the field formations. The troops enlisted within the regiment are loyal and take pride in the regiment’s traditions, often based on an old regional history and cultural specifics. Some Infantry regiments selection is indeed based on strict regional, ethnicity, or religion criteria (Assam, Jat Regiment, Sikh Regiments for example). From the Raj, Ladakh, Arunachal and Sikkim Scouts, are specialized in border defense were created after 1947. However, over the years and better mobility and urban development, the loyalty towards local regiments had tendencies to be rejected over loyalty over the union of India, contributing to create free Indian regiments like the Brigade of Guards and the Parachute Regiment. Actual Combat doctrine is partly based on combat experience and partly based on British-inspired traditions. It is a combination of holding formations and strike formations. The holding formations must contain and pin down the enemy while the strike formations had to counterattack at a chosen spot. 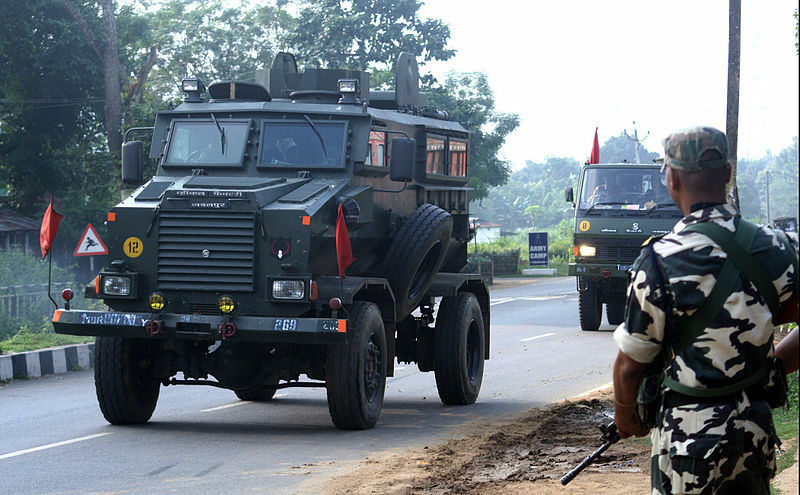 It is unique to the Indian Army’s size to have such specialized corps affected to the strike role, which is reflected in their training and equipment. Special forces capabilities are also a recent creation. There is no tradition of Marines, but there are currently plans to set up a marine brigade, according to the growing strength of the Indian navy and the introduction of amphibious capabilities. There are currently 63 armoured regiments in the Indian Army. The 1st Horse, 2nd Lancers, 3rd Cavalry, 4th Horse, 7th Light Cavalry, 8th Light Cavalry, 9th (Deccan) Horse, 14th (Scinde) Horse, 17th (Poona) Horse, 15th Lancers, 16th Light Cavalry, 18th Cavalry, 20th Lancers, and the 21st (Central India) Horse based on XIXth century units, with extra ones created since Independence. Their equipment, duties and training also reflect the traditions of the cavalry type, like in the British Army. There are currently eight army corps, the New Delhi HQ, Central command at Lucknow, Uttar Pradesh, Eastern command at Kolkata, West Bengal, Northern command at Udhampur, Jammu and Kashmir, South Western Command at Jaipur, Rajhastan, Western command at Chandimandir, Haryana, and the Training command Shimla, Himachal Pradesh. The Vijayanta, Indian first MBT, designed in the 1960s as a lighter Centurion in cooperation with Vickers (still referred as the Vickers mark 2). At least until 1960 the bulk of Armoured Vehicles and tanks came from Great Britain. 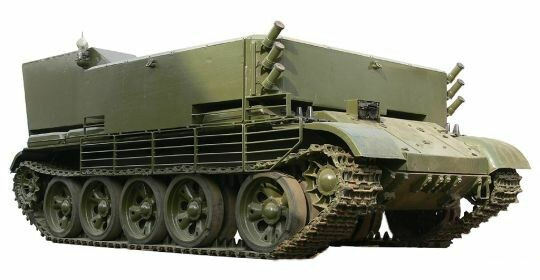 Early equipments included British Armoured cars like the Ferret (now discarded), and older ww2 British old stock models, but no modern tanks before the arrival of the Centurion Mark 7 main battle tanks in the early 1960s (which saw immediately combat against US-built Pakistani tanks). Centurions were gradually replaced by the Vijayanta MBT in the early to mid-1980s. The next Indian MBT was to be Vickers proposal of a simplified and lighter Centurion to be built in India under licence. About 2,200 were built by the Heavy Vehicles Factory until 1986, gradually upgraded, but now placed into the reserve. 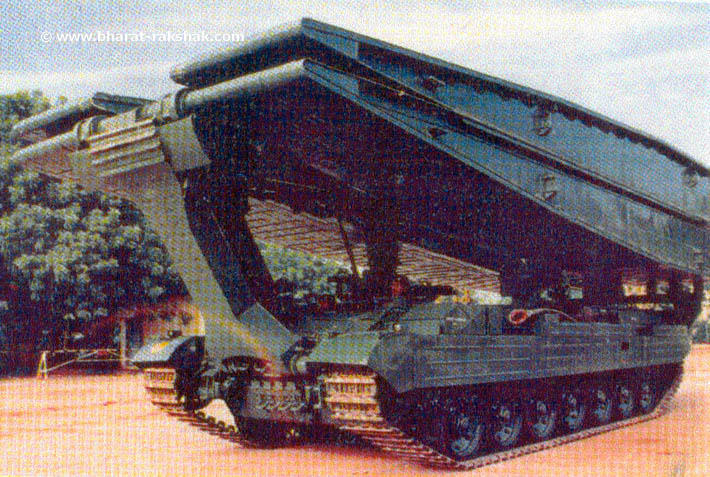 Shortly after, the development of a new MBT started, known today as the Arjun. This development took thirty years, from 1974 until the first production tanks were out, in 2004. 248 are now in first line service, but only counts for a small portion of the bulk of the Armoured forces equipped after a change of policy with soviet origin tanks. Indeed, 800 T-55s were acquired in the 1960s, followed by PT-76 light tanks, BTR-50, 152, 60 and 80 APCs, BMD-1/2s, PRP-3, Czech OT-64 SKOT, Polish OT-62 TOPAS, BRDM-2s. 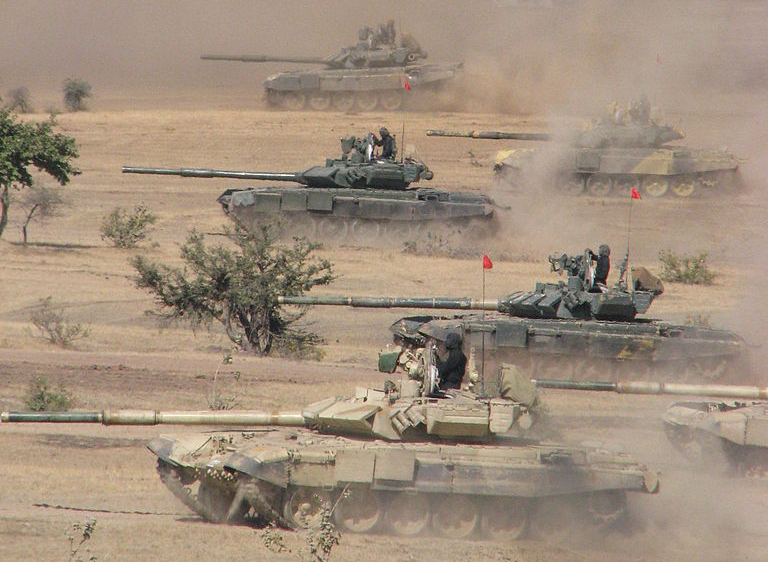 T-90S Bhishma in exercises. These forms the bulk of Indian division today and more are in service today under Indian colours than in Russia ! These are on par with the best 3rd generation MBTs today. 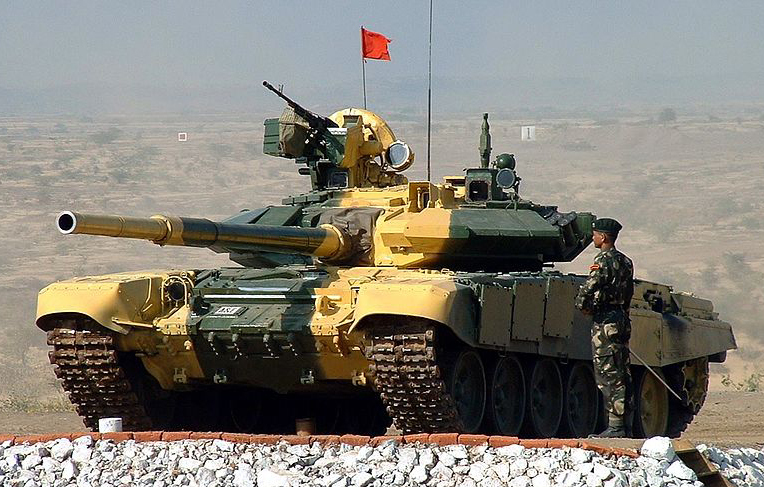 The bulk of the Indian MBT force today is provided by the 2,400+ T-72M1 “Ajeya” co-produced with Poland and Russia together with 1,250 T-90S “Bhishma” with Russia. The Arjun only counts for a few in this total due to a much higher price tag and are given to elite divisions. The Vijayanta are now long retired but for training and as variants. 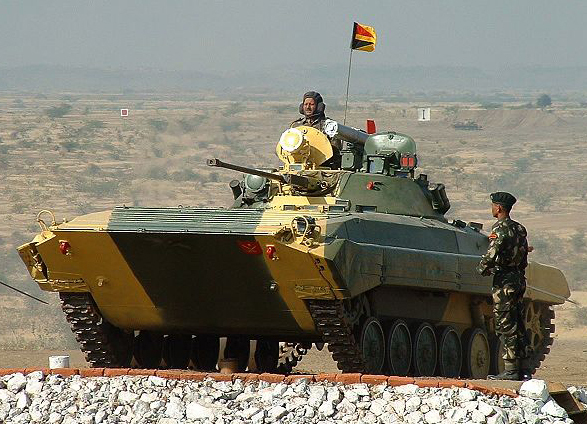 Modern Indian IFV supplies came from co-produced BMP-1 and BMP-2 “Sarath” IFVs (1200+). 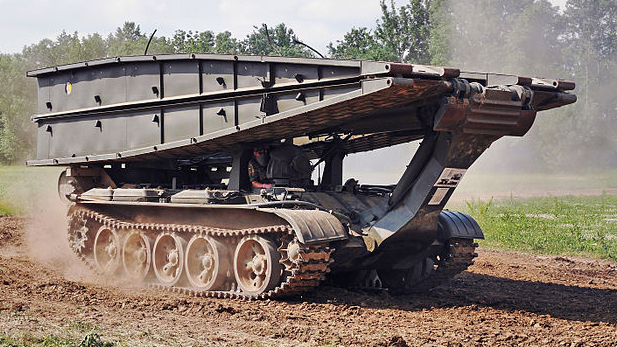 In addition 900 Tarmour heavy tracked APCs (local construction, based on T-55 chassis) are still in service. Also 100+ (out of 200) BTR-50 are maintained in service. Specialized missile tank destroyers, the Namica, are built on the Sarath chassis (2013). 13 were produced out of 200+ by Ordnance Factory Medak and L&T. There is no mass-production APC in service which is a lack of mobility for the infantry divisions. The Sarath (BMP-2) has been also derived into the CMT mortar carrier version (200 on order), as well as the DRDO Armoured Ambulance, and the NBC Reconnaissance Vehicle (CRBN). 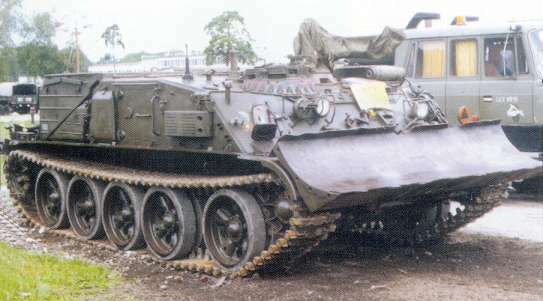 Also related are a few PRP-3, or NATO BMP M1975 Battlefield surveillance systems; An undisclosed numbers of former APCs OT-62 TOPAS and OT-64 SKOT are now used as Technical support vehicles. 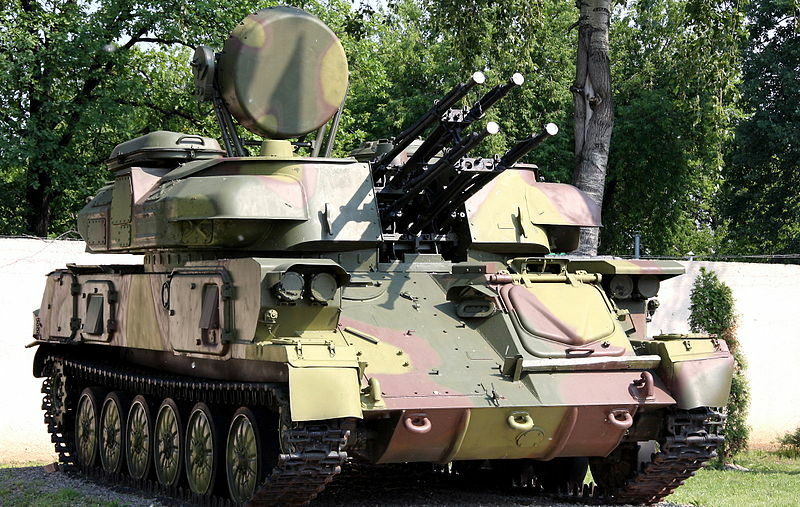 Ported artillery is provided by 80 FV433 Abbot SPGs, 100 M-46 Catapult (based on the Vijayanta), 110 2S1 Gvozdika, 62 Smerch 9K58 MRL, 80 Indian-built Pinaka MBRL, and 150 BM-21 MRLs (rocket launchers). Various vehicles can be equipped or carry a large array of Indian ATGMs of various provenance: Spike (Israel), Milan/2T (France, and built under licence), Russian 9M133 Kornet, 9M113 Konkurs (licence), 9K114 Shturm, 9M120 Ataka-V, 9M119 Svir, 3UBK-Invar, and 9K121 Vikhr. Two models are Indian-built, the Nag missile used on the Namica TD (see above), and the 125 mm CLGM Missile (gun launched) for the T-90 and T-72. Outside SAM missile carriers like the 80 9K33 Osa 6×6, there are 250 SA-13 Gopher (9K35 Strela-10) in service, and SPAAGs in service are the 180 2K22 Tunguska (SA-19 Grison) and 75 ZSU-23-4M Shilka,and infantry can be equipped with 4 types of Manpads, including Stingers, SA-14, 16 and 18. AVLBs: 34 Kartik ABL, based on the Vijayanta chassis, MT-55 (unknown) based on the T55 chassis, T-72 BLT (12), 8×8 Sarvatra VLB (unknown), and 6 CEASE or Canal Embankment Assault Equipment. ARV, CEVs: BMP-2 based AERV (unknown), 7362 BMP-2 Dozer, 39 FV180 Combat Engineer Tractors (UK import), 196 WZT-2, 352 WZT-3M and 200+ VT-72B ARV Polish/Indian ARVs, and an indisclosed numbers of Armoured Vehicle Tracked Light Repair BMP-2 based vehicles, and light ARVs as the VFJ, Yuktirath, CL-70. 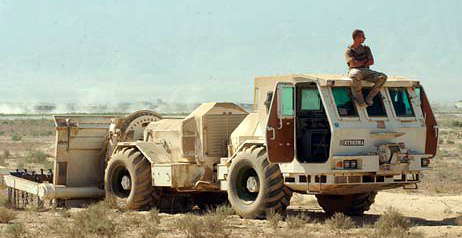 MPVs and MRAPs: India also operated 255 South African Casspirs, alongside 1300+6 Aditya MPVs and 24 Hydrema mine clearing vehicles. For mine warfare, there are many T-72 FWMP kits made readily available for mine-clearing operations, as well as a robot, the DRDO Daksh for bomb disposal. Like most ground forces in the world, the Indian Army Aviation Corps is limited to rotary-wing aircrafts, the recent attack helicopters HAL Rudra (2012) with 22 built and 150+ on order and most importantly the HAL LCH or Light Combat Helicopter, a pure, two-seats attack helicopter (2010) of which 140 are on order. This is a perfect “tank killer” with advanced detection and FCS servicing a Nexter THL 20 cannon, AP/HE rockets and ATGMs. Future developments includes the Arjun MBT Mk.2 (Production in 2014), FMBT – The FMBT concept (50 tons), the DRDO FICV (Future Infantry Combat Vehicle program) to replace BMP-2s IFV and projects for a new MBT with an active protection system to defeat Fin Stabilized Armor Piercing Discarding Sabot (FSAPDS). This first operation, high in the mountains bordering Pakistan, saw only ww2-era British-built armoured cars in action, which action was decisive. 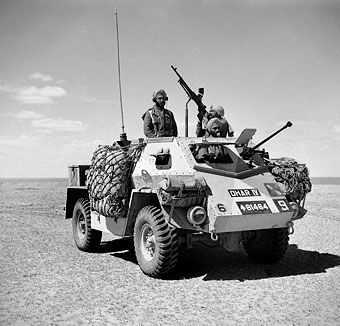 These were the armoured car cavalry units of the Hyderabad State Forces (Hyderabad lancers) equipped with Humber and Staghounds. The previous year, the Kahsmir war mostly seen infantry actions and few armoured vehicles involved. War erupted after negotiations failed between Portugal and Indian for these small enclaves. Armoured Cars were involved in the fight to Goa, opposing the 1st EREC and the 9th Caçadores. The war erupted over the control of neighbouring regions of the Aksai Chin and Arunachal Pradesh and the McMahon Line. The conflict saw freezing combat condition in high altitude, and few if no armoured vehicles were used due to the nature of the terrain. This was a comprehensive defeat in this infantry engagement, mostly because of the numerical superiority of the Chinese and poor defensive management. Pakistani M47 exhibited at Bangalore, memorial for the battle of Asal Uttar, which was with Chawinda, some of the greatest tank battles since ww2. Fought in open plains and deserts, this serie of actions for the Jammu and Kashmir involved for the first time large scale tank actions over a wide area. Among others, the 1st Armoured Division was blunted at the Battle of Asal Uttar, and the Pakistani forces were comprehensively destroyed at the following Battle of Chawinda, followed by the second battle of Asal Uttar. On the Pakistani side, at Chawinda, 132 +150 in reserve Shermans and M47 Pattons took part in the action, opposed by 225 Sherman and Centurion Tanks on the Indian side. The knowledge gained in this war was instrumental in the design on the Vijayanta and in the development of new Pakistani tactics. The next round will be less one-sided. A mere skirmish also known as the Chola incident started after some PLA elements infiltrated the Sikkim, an Indian protectorate. This was mostly an infantry fight, which left far more casualties on the Chinese side, which retreated and signed the peace to the condition that the Tibet Autonomous Region was recoignised as part of China. 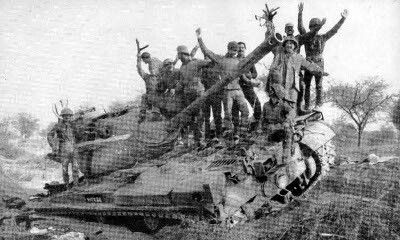 Indian troops celebrates on a captured M47 Patton at the battle of Basantar (Battle of Barapind) (4-11 december 1971) where the Pakistani forces lost some 46 tanks on the Western Sector. Also known as the Bangladesh Liberation War this major conflict saw the end of the “Eastern Pakistan” which seeked independence. A local insurrection was brutally crushed by Pakistani Forces, until the end of 1971 when elements of the Indian Army intervened. The next move was a pre-emptive attack from the Pakistani Air Force that did not achieved all its objectives but secured a perfect alibi for India to declare war and engage its full divisions in the east. At the ensuring battle of Longewala, the Pakistani losses amounted to 138 armoured vehicles, including 38 tanks. At the battle of Basantar, 66 were lost and 40 captured. Dhaka was taken on 16 December 1971, along with 90,000 prisoners of war and followed by the Simla Agreement, the roots for the future state of Bangladesh. The Ajeya Mark I in action. Like the Siachen glacier skirmish in 1984, again upon bordering regions of Jammu and Kashmir with Pakistan, the Kargil war saw limited use of armoured vehicles due to the nature of the terrain. Artillery and aviation reigned supreme. However armoured vehicles were sent to Sri Lanka in 1987 for peace-keeping operations and actually were heavily engaged. The Arjun mark 2, here in exhibition, is the latest version of the 3rd generation Indian MBT. Arjun Mark 1 on a track test. WZT-2 ARV. 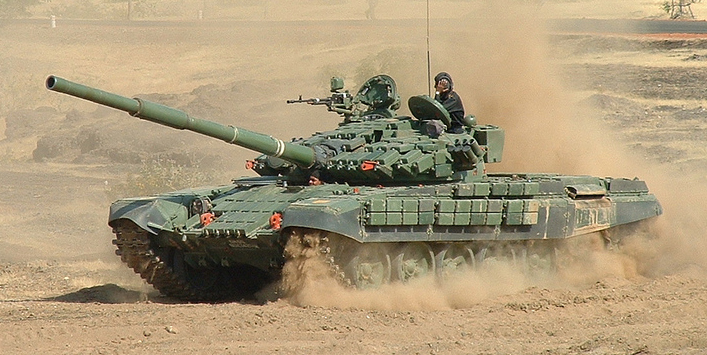 After Poland, Indian was the world’s largest user of this Polish T-55 based vehicle.